Egami, the Japanese photo blog has uncovered another Canon patent. It involves a lens with double mounts, one on each end. The objective is apparently to increase the magnification of the lens. Below is a Google translation of the literature into English. I am not sure how useful this new patent will be but tinkering gives Canon's engineers valuable time in the laboratories for research and development into new products and technologies. By attaching a wide angle lens in reverse and attaching it to the camera, you can obtain the magnification higher than the general macro lens by using in combination with the bellows. In the past, adapters such as reverse attachment and bellows were abundant, and since the lens was not electronically controlled, it was possible to freely control the aperture and focus. Recently, however, if you reversely attach, the number of lenses that neither diaphragm nor focus will move is increasing. Canon I of the patent application seems to be on both sides of the lens providing the electronic contacts. In this way it will be possible to control both aperture and focus, so it may be easy to enjoy high magnification. 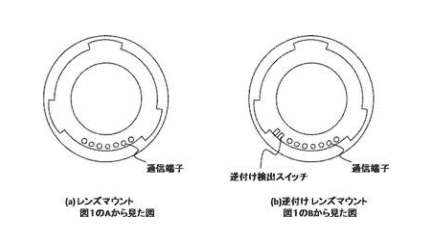 As estimated from the filing date of the patent, though it was considered in the development of the EF-M 28 mm f/3.5 Macro IS USM, the reverse proposal would have been dismissed. EF-M 28 mm f/ 3.5 Macro IS USM has realized the magnification of 1.2 times (about twice as much as 35 mm format conversion), and users who need more magnification will adjust their shooting facilities on their own. It seems unnecessary to commercialize the reverse application function in patent application. Somehow, EF-M 28mm f/3.5 Macro IS USM seems to be designed to be conscious of reverse attachment.